How Will You Measure Your Life? by Clayton Christensen is an interesting book from the renowned business professor and author of The Innovator’s Dilemma, a work praised by luminaries such as Andrew Grove and Michael Bloomberg. 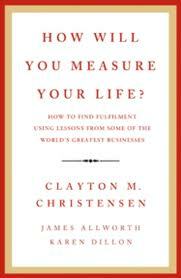 Christensen’s latest work was co-written with James Allworth, a student of his at Harvard and Karen Dillon, editor of the Harvard Business Review and I heard about the book from the Businessweek piece “Clay Christensen’s Life Lessons” by Bradford Wieners. The book is a blend of business and life lessons (with many covering both areas) and has a number of interesting points made throughout. The first part of the book is more business focused and an initial idea put forth is Christensen espousing frameworks, how to think and solve problems rather than more narrowly focusing on what to think or the solution to any one quandary. Related to this is his view of job satisfaction being driven by both hygiene and motivation factors. The first factor contains often very necessary things like money, but not necessarily the motivating things that would cause someone to excel. Looking a bit past just the individual to include a company view as well, Christensen notes the importance of assumptions in pursuing a goal (again, either for a person or a business), specifically the question of what has to prove true for a plan or approach to have the results you seek? In the next section, the book focuses more specifically on individuals and their relationships. To this end, the peril of sequencing is brought up, specifically being willing to push aside important life or relationship investments now with the belief that you’ll get to them later. It’s noted that this approach will often result in important moments simply passing someone by. An example of sorts is given with the story of babies and language. Christensen writes of language dancing, adults carrying on real conversation with an infant and how the frequency of this interaction and sheer volume of words exposed to can have a large impact in the mental development of a child. Another idea that stood out from this portion of the book is one that could be taken as a business lesson, but perhaps has more impact in relation to personal relationships. The question of what job does something serve? is brought up and Christensen then covers some interesting and important points on the subject. He writes that "the two fundamental jobs that children need to do are to feel successful and to have friends- every day" and then encourages the reader to “think about what jobs your spouse is looking to you to do” and follows that up with the idea of seeking not to find a mate who will make you happy, but one whose happiness would be important enough that the investment of time and energy to make that happen would be worthwhile to you. The next idea of note from the book was also one that could be about either work or family and covered the danger of outsourcing important things (whether tasks for companies or personal development for children). Along with this was covered the importance of capabilities and how they’re made up of (A) resources, (B) processes and (C) priorities… basically what, how and why. If parents are always on with their kids, they’ll help them develop good processes (goes back to the how to think framework noted earlier) and hopefully take on the priorities both spoken of and that they themselves model for their children. It’s a fairly obvious point, but certainly an important one Christensen makes around setting examples all the time with the idea that "children will learn when they're ready to learn, not when we're ready to teach them." Through this example setting and lesson teaching can come the right processes and priorities, including things like determination and kindness (there’s a nice anecdote from Christensen about teaching his kids that their family should be known for kindness) and collaboration with others. Very much related to all of this was an excellent quote made around children (but, frankly, would apply to anyone) with “self-esteem comes from achieving something important when it’s hard to do." Last thing covered in the book is yet another idea that would apply at both a business or individual level and that’s the importance of a defined purpose, one that’s comprised of (A) a likeness or end goal, (B) a commitment to pursuing that and (C) metrics to measure progress against the goal. All in all, I thought it a very solid book with excellent ideas both around businesses and individuals.